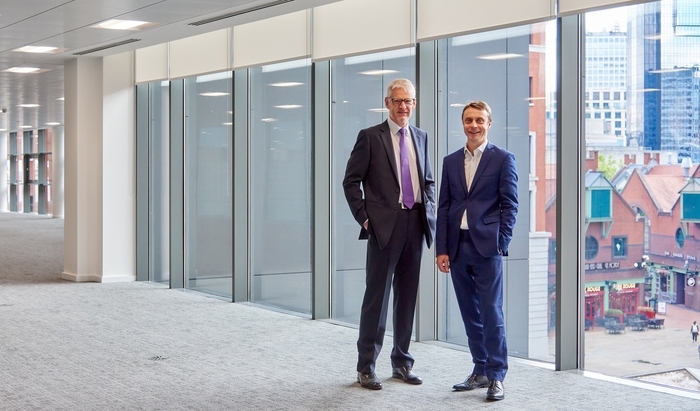 (l-r) David Tonks of Cushman and Wakefield and Charles Toogood from GVA who represented Unity Trust Bank and Brindleyplace respectively. Unity Trust Bank, a commercial bank with a social conscience, has recommitted to Birmingham’s Brindleyplace estate, extending its lease and moving to a larger space. Unity Trust Bank has taken a 10,888 sq ft suite on the third floor of Four Brindleyplace on a straight 10 year lease, relocating from its current space at the Oozells Building – formerly Nine Brindleyplace – which it has occupied since 2005. Overlooking the main public realm of Central Square, Four Brindleyplace is one of the most highly sought-after commercial locations in Birmingham. GVA and Savills are joint letting agents at Brindleyplace acting on behalf of the asset manager, Hines UK. Cushman & Wakefield acted for Unity Trust Bank on completion of the deal. A specialist bank for organisations and businesses that aim to create community, social or environmental benefit, Unity Trust Bank provides tailored day-to-day banking and finance to groups including small and medium enterprises, charities, social enterprises, trade unions, housing associations and councils. The suite at Four Brindleyplace will now undergo a full fit-out prior to occupation by Unity Trust Bank in September 2018. Other occupiers at Four Brindleyplace include Deloitte, Mercer and Michael Page Group. The Brindleyplace estate represents one of the country’s leading mixed-use leisure and commercial destinations, with offices suitable for a range of occupier types. Space at Brindleyplace is in high demand with just 57,000 sq ft available. Nine Brindleyplace is being transformed by Hines UK into The Oozells Building through an extensive £4 million programme of refurbishment works across its vacant suites and common areas. The completed building is due to relaunch later this summer.